Highland View Rabbitry has been a family owned rabbitry for over ten years. It has been passed down traditionally through siblings. Recently I have started sharing the barn with my younger brother Micah. It has been owned and run by Joel, Sarah, and Nick Crawford. For awhile my younger sister Eliza showed rabbits but she decided the hobby wasn't for her. 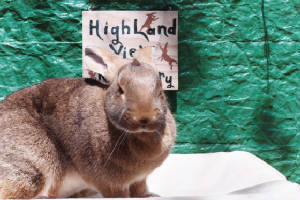 Highland View Rabbitry has never limited itself to only owning certain breeds. We pride ourselves on owning and breeding many different and diverse breeds. This has helped us to find which breeds are hardy for the area and has allowed each owner to have their own breed. The following breeds have found a home in our barn: Californians, New Zealands, Satins, French Lops, Dutch, English Spots, Netherland Dwarfs, Standard Rex, Mini Rex, Mini Lops, Flemish Giants, English Lops, Silver Martins. 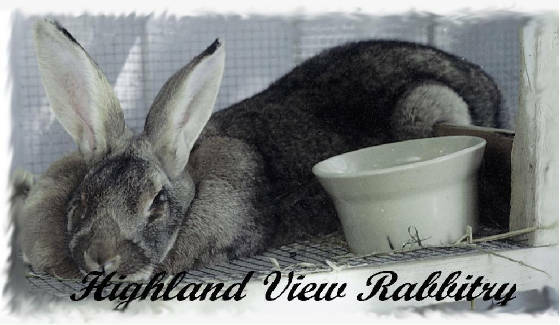 Currently Highland View only houses Mini Lops and Flemish Giants. In 1990 my family moved from a growing city to a farm in rural Caledonia. My family brought with one parakeet and a New Zealand Flemish Giant cross. They were a bit surprised to move to the farm and become the owners of some cats, a dog, and a shed full of 4-H rabbits. The rabbits were sick and hungry. My family nursed them back to health and soon my older siblings joined 4-H and started showing and breeding rabbits. Two years later, though, we moved from the farm into town. The cals, satins, and new zealands were left behind. My sister bought a pair of French lops and showed and bred those. Soon I became old enough to care for rabbits and adopted Oreo, a black dutch, from the Humane Society. Soon after we adopted another blue buck and I bought a black doe. My sister got an English spot and my brother a Netherland. After a few unsuccessful breedings a sold the doe and began to look at new breeds. At our county fair a petting zoo had some jr. Flemish Giants for sale. Jokingly I asked my mom if I could get one and she said "yes." I bought a beautiful light grey doe, but she died a few months later. I then bought two light grey bucks, but a German Shepard got into the barn and killed one of them. I received money from the owner of the dog so I got on the internet to locate a breeder so I could get a doe. I found a breeder and he introduced me to the ARBA and the world of rabbits. Since then I have established a good starting stock of Flemish and have started raising english lops and Thriantas.